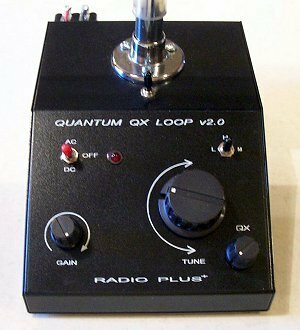 The just-released QX Loop v2.0 from DX-Tools is an upgrade to the former QX Loop and QX Pro Loop. I’ve long read about these products in glowing terms from DXers and radio hobbyists and decided it was time I got my hands on one for evaluation. Being a life-long antenna enthusiast I was curious to see just how good the Quantum would be and to compare it with other antennas I use regularly and specifically the well-known Twin Coil Ferrite antenna from C.Crane which I have reviewed previously. The first thing you will note if you email Gerry at DX-Tools is that you are dealing with a dedicated individual…a true radio lover who makes these one at a time by hand, not a large company. That means you may have to wait a week or two for him to finish a production run before he will have one to sell to you. But it also means he will communicate with you personally, apprising you of progress and how his burn-in and testing on your unit are going. In my case, I received a unit from the first production run of this newly-revised model and it was necessary for Gerry to take a bit of extra time to fine tune things and be sure it was operating to its maximum potential. In fact, it was necessary for me to return my unit to him for a small tweak, but after several emails back and forth I am convinced this was an unusual circumstance due to the newness of the design and not at all indicative of his usual quality control.. Gerry has sold over a thousand of his antennas with defects in the low single numbers, and that is a far better track record than any large scale manufacturer I am aware of. 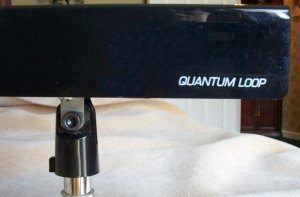 I have just finished several weeks of testing the new Quantum Loop and its performance ranks it among the best active AM antennas I have used. 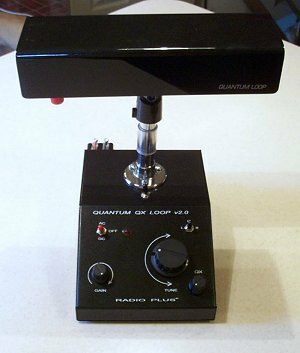 The Quantum Loop is a medium-sized desktop unit with a control base measuring about 7 ½” x 5″ x 2 ½”. The swiveling loop head which plugs into its top measures about 8 ½’ x 2 ½’ x 1 ½’. It can rotate and swivel into any position which allows for unusual flexibility in aiming and nulling. This is the loop head for the AM Broadcast band…other loop heads ar available for LW and SW Tropical Bands from 1.7 MHz through about 6 MHz. However, the base unit remains the same as opposed to the earlier models which used different bases and loop heads. Gerry informs me that the new model performs at least as well as the older units and at about the same cost for multi-band use. RF output is via a standard SO239 jack which accepts a PL259 plug for a direct connecting to radios equipped to handle it. Alternately, the Quantum Coupler, a $15 accessory can be used to inductively couple the output to a radio which lacks an antenna input jack, or when it is desirable to utilize this arrangement for other reasons which I will describe further on. 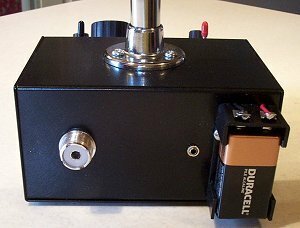 The antenna can be operated from a standard 9 Volt cell or an optional wall-wart ($5). Finally there is a binding post input for an external wire antenna on the loop head which allows you to use the Quantum’s tuning and amplification capabilities to enhance the signal from an external antenna. As stated in the instructions, the Quantum Loops are intended for “dedicated MW DXers.” As such the controls offer an unusual range of adjustment and there is somewhat of a learning curve to fully appreciate what this antenna can do. There is a toggle switch for Power and to select AC or DC input, a full range rotary Gain Control, a three position “Tuning Range Extender” to select tuning ranges of (Low) 530 to 600 KHz, (Medium) 600 to 800 KHz and (High) 800 to 1700 KHz. And of course there is a large rotary Tuning Control to peak the signal. There are also some less-used controls. They are the “Q Spoil” and “QX” (Q Multiplication) controls. Indeed the instructions say to generally leave them in their “Off” positions. However, their very specialized control functions are part of what sets the Quantum Loop ahead of the other active AM antennas I’ve used and a dedicated AM listener will want to master their operation to fully explore what this antenna can do when the going gets tough. I will describe their operation in due course. I first ran two series of tests and tabulated the results. In each case I compared the Quantum Loop against a radio using its built-in antenna and against the C.Crane Twin Coil Ferrite. I later did some additional tests against other antennas I had at my disposal. The first set of comparisons used a Grundig Satellit 800 via a direct connection. The radio and both antennas were operated from AC Power for consistency. I chose the SAT 800 because it is a good AM receiver when used with an external antenna and it has a calibrated S-Meter along with switch-selectable Fast AGC which makes these comparisons easier to make. I used an RF switcher so I could easily compare both antennas repeatedly in case signal levels or interference varied…this rapid A/B switching reveals subtleties that may be missed if you are disconnecting and reconnecting antennas. In the second set of tests I used a Sony 2010 portable via the Inductive Coupler with the radio and both antennas running from battery power. I chose the 2010 because it is a sensitive AM portable with a 10 LED signal strength readout and an RF attenuator which together allowed me to more easily assess the quantity and quality of signal coming from each of the antennas. These initial tests were run at midday when groundwave signals are the most stable and there is a wider range of truly weak signals to use as check points. I later tested at night when there is more of a hodgepodge of strong yet fading signals to see how the antennas would compete under these conditions. The results were extremely interesting. Note: If you are new to S-Meter readings, they are given as S units from 1-9. Above S-9 the numbers represent “db over S-9″ (usually stated as “blank” db over”, so a reading of S-10 is stated as 10db over S-9, or written as S-9 plus 10 db. However the signal strength numbers don’t even BEGIN to tell the real story here. If they did, there would be little reason to own either of these antennas! In all cases the signal was MARKEDLY cleaner and much more noise-free resulting in a much better listening experience. On many of the signals near the low end of the band the S-meter readings on the unaided radio were more noise than signal. As a program listener the difference was sometimes night and day. A hard-core DXer, chasing the faintest of signals, and perhaps in an electrically quieter setting, would find even larger differences. Let me explain with some specifics. 530: This is a TIS (Traffic Information Station) from a highway about 3 miles distant. Although it indicated S-5 on the SAT 800′s built-in antenna it was not listenable. A strong 60Hz buzz from the power line all but obliterated it. The signal strength reading of S-5 was almost all noise and not the actual signal. However, substituting either the Twin Coil or the Quantum Loop dropped that buzz to virtually nothing (once the noise was carefully nulled) leaving a very clear and listenable signal. In this particular case there was only a slight difference between the Twin Coil and the Quantum…the Quantum was able to null the noise a bit more fully with NO trace of buzz left in the audio, while the Twin Coil left only a small trace of the buzz. The difference was subtle but easy to hear on a direct A/B comparison. 740: Here there was very little electrical interference and the numbers give a truer picture of the signal gain these antennas provide. The unaided radio indicated S-4 and the signal was not at all pleasant to listen to. The Twin Coil gave a big increase to S-7 and the Quantum to S-8. The level increase translated to a much more listenable signal…it was now good enough for a program listener to enjoy. Again, the Quantum was just a hair better than the Twin Coil as the numbers show. 680: Here we get a slightly different picture. This signal is directional away from my location and suffers heavy interference from a number of other unwanted signals arriving from other directions. The unaided radio showed an S-5 but the desired station was not audible at all…there was just a pileup of jumbled interference and garbage. The Twin Coil improved the signal level to an S-6.5 and I could now make out the desired signal well enough to ID it. Switching to the Quantum further increased the reading to S-7.5 but dropped the noise and interference level a bit further. It was apparent that I was not only receiving a stronger signal from the desired station but also nulling the unwanted signals even further, so the net improvement of “signal-to-garbage” ratio (my own term) was noticeable and impressive. Gentle use of the QX circuit provided a bit more cleaning up of this signal and helped set the Quantum in a class by itself in its ability to extract maximum useable signal out of what started out as a garbled mess. It is beyond the scope of this report to describe in detail how the QX circuit works, but I will summarize it by saying that it allows you use regeneration to increase the gain rather dramatically, and at the same, narrow the passband of the antenna to eliminate interference from neighboring frequencies. Although this is unique among antennas I’ve owned, its use is well explained in the instructions and it is very intuitive once you’ve tried it a few times. I suspect it will be a real bonus at nighttime when many more tightly spaced signals are present than during the daytime, but this is one good example where even a daytime signal was cleaned up nicely through its use. *(See addendum for more on the QX control from the Quantum’s designer Gerry Thomas). With most portable radios you will get best performance using the inductive coupler (with any amplified external antennas) for a few reasons. First, many portable radios simply don’t have auxiliary antenna input jacks so the choice has already been made for you. Second, many world band portables which do have aux antenna input jacks specifically attenuate AM signals in order to prevent them from causing interference in the SW bands. This means you will get a stronger signal by inductively coupling to the radio’s built in ferrite rod antenna. A final consideration is whether or not using an external connection disables the internal antenna. Many portable radios leave the internal antenna active even when an external antenna is connected. Try putting a plug into the radio’s antenna jack while listening to a weak signal and note if it disappears or not. If there is no change, the internal antenna is still working. Finally, any radio which uses antenna screws or spring clips for an antenna input will expect a high impedance signal (these antennas put out a low impedance signal) and they also leave the internal antenna active. If your radio leaves the internal antenna active it does not ruin your chances for success, but it does impose some limitations which you can minimize if you are aware of them. Primarily, nulling of noise and unwanted signals will not be as complete because, even if you null the noise coming from your external antenna, the radio will still be picking it up and adding it to the mix. Here are two approaches I’ve used with success. First, if you are fighting interference from another station or electrical buzz from your surroundings, once you’ve found your target station on the portable radio, rotate it so as to minimize the interference. Or, if your radio has an attenuator or Local/Distant switch, reduce the gain until the noise goes away or is at least reduced. Now, when you supply a cleaner signal from your external antenna you will get a cleaner result. This takes longer to explain than to do, but understanding the concept is key to maximizing performance on any radio in which the internal antenna cannot be disabled. For my tests with the Sony 2010 I used the “Local” setting to desensitize the radio enough to keep most local interference from being a problem. Then, for each station, I used the antennas “sender” or ‘coupler” unit to couple the antenna to the radio. With either of these couplers, there is a “sweet spot” where maximum signal transfer is achieved, and once found, it remains the same for all signals. The small sender of the Twin Coil is slightly more critical to locate than the large coil of the Quantum, but again, this is a one time procedure so the difference is negligible. I used many of the same signals as I did for the first series of tests. Here though the differences between the two antennas were less apparent. Both antennas provided noticeably stronger and cleaner signals than the radio could pick up on its own (of course, I switched form Local to DX when testing the radio on its own internal antenna). I would describe some of the differences as night and day, with weak, noisy or interference-ridden signals cleaned up to the point of being enjoyable to listen to using either antenna. Between the two antennas there were times when the Quantum provided a marginally stronger signal level, but the listening quality was essentially the same…a difference of 1 LED on the Sony at most. In a few instances I was able to null the noise just a bit better with the Quantum than with the C.Crane but I would have to describe the differences as subtle. Later at night the superiority of the Quantum was slightly increased rendering a few signals more clearly than the Twin Coil and I suspect that given more time I would find more instances where the Quantum’s increased control flexibility would prove to be even more valuable. If you have followed my reviews in the past you know I am a huge devotee of the Wellbrook ALA-330s amplified loop. Although this is primarily a SW antenna which just happens to work very well on AM (Wellbrook also offers the similar ALA1530s which places more emphasis on AM with a bit less gain on SW), the Wellbrook has been my reference antenna for both SW and AM. The Quantum is the first dedicated AM antenna I’ve tried that actually outperforms it on most signals. The Wellbrook is noted for its clean signals, not necessarily high signal output levels, but consistently clean signals that sound good even though the S-meter may read a bit lower than with some other antennas or my 75′ random wire. The Quantum provides generally much stronger signal levels across the board and sometimes better noise rejection than I can achieve on the Wellbrook. The Quantum has therefore become one of my two reference antennas, both now permanently connected through the RF switch at my prime listening location. The Quantum has expanded the number of AM stations I can receive listenably and reliably and that is what it’s all about. And one note from the C. Crane Twin Coil review…that antenna does allow for remote placement which may be necessary in situations where your building causes severe signal attenuation such as an office or apartment building or mobile home. The Quantum must be located near your listening location. Some Words From The Manufacturer: As I mentioned, Gerry at DX-Tools is a dedicated radio guy who loves radios, antennas and DXing. As such he offered me more detail on the use of the QX Control, excerpts of which I would like to share with you. “One thing that isn’t mentioned in the instructions (which I’m presently re-writing) involves the nuances of the QX control. It takes a while to stumble on this on your own so I’ll mention it here because it does further set the Quantum apart from other antennas. It has to do with digging out a readable signal in the presence of adjacent channel splash. For example, here in Pensacola we have a very sloppy 10 kW station on 980 kHz (WRNE). It’s several miles from here but puts out at least S-9+40 and produces heavy slop between about 940 kHz and 1020 kHz. Trying to hear anything on 970 kHz or 990 kHz is impossible unless 980 kHz is nulled. Now there is a station down in Tampa (several hundred miles across the Gulf of Mexico) on 970 kHz that is a 5 kW. Unfortunately, it is in exactly the same direction as WRNE so I can’t null the pest. The station on 970 kHz is completely inaudible on any radio/antenna combination in the shack. 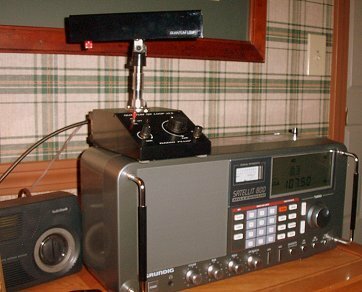 I’m talking top-end radios (e.g., Watkins-Johnson HF-1000, ICOM R-9000, Drake R-8, JRC 535D, etc.) using every trick in the book…LSB with very narrow filters, PBT, notch, etc. It simply isn’t audible on anything, including the QX Loop v2.0 unless I use the QX control. That is, I can advance the QX control just short of oscillation so that the 980 kHz station has just about pegged the S-meter, then carefully tune the loop down to 970 kHz (it’s impossible to peak the QX on 970 because I can’t hear anything). At this extremely narrow passband, audio is extremely muffled because most of the sidebands have been cut out. By carefully, adjusting the tuning on the loop to the LSB side of 970 kHz, I get weak but easily readable audio (even in the AM mode and wide IF filter settings). This takes some time and some practice but the results speak for themselves. Again, this station is simply not audible (much less readable) on any other radio or antenna in the shack. This technique has enabled me to dig out some really tough signals in the past, especially many transatlantic stations on split frequencies adjacent to the domestics. If you have a strong local that you can’t null to hear a distant station on an adjacent channel, you might try this technique. Another tip re: daytime DX. Let’s face it, there’s just so much signal-gathering a 7.5″ ferrite rod can do regardless of the coil design, the amplification of the electronics, or the extra oomph provided by the QX circuit. For really serious, long-haul daytime DX, I’ve got the best results by hooking up an external antenna to the loop head. I get at least a 25 dB kick with my 100′ longwire but any length external antenna will improve the loop’s reach. And by using the controls on the v2.0, there have been many instances whereby I’ve heard stations that were simply not audible on either the loop or the external antenna alone…adding the amplification and tuning of the loop (not to mention the QX feature) to the signal from the external antenna really extends the reach of the outside antenna.